The KG Moats & Sons team has years of experience in the development of state-of-the-art metering and blending skid systems. Our skids incorporate the latest in remote control PLC technology and precise instrumentation, and are designed and fabricated to ASME B31.3 Featuring off-the-shelf instrumentation and non-proprietary software, our systems are pre-built to your specifications and then transported to your site. Working with our customers, we design our skids in-house, starting with a site plan, general specifications, and flow diagrams and ending with a working skid. 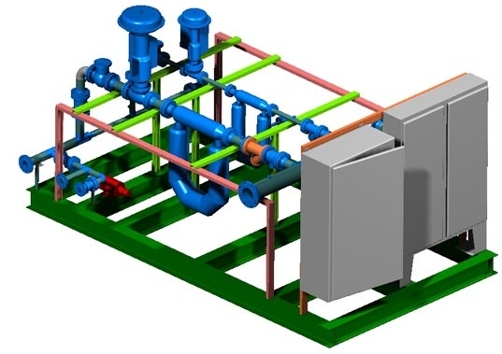 We use advanced software tools to prepare electrical schematics, PID diagrams, pneumatic drawings, control programs, and physical drawings, both 2D and 3D. We respond quickly to our customer's requests, and remain flexible in our solutions. If you are interested in a KG Moats & Sons solution, please contact us about your application.